Its finally here, my day for the Black Cat Crossing Blog Hop. 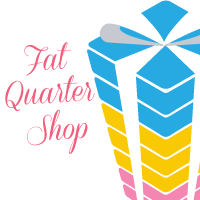 This blog hop is marks the one year anniversary for me with Sew We Quilt Blog Hops. 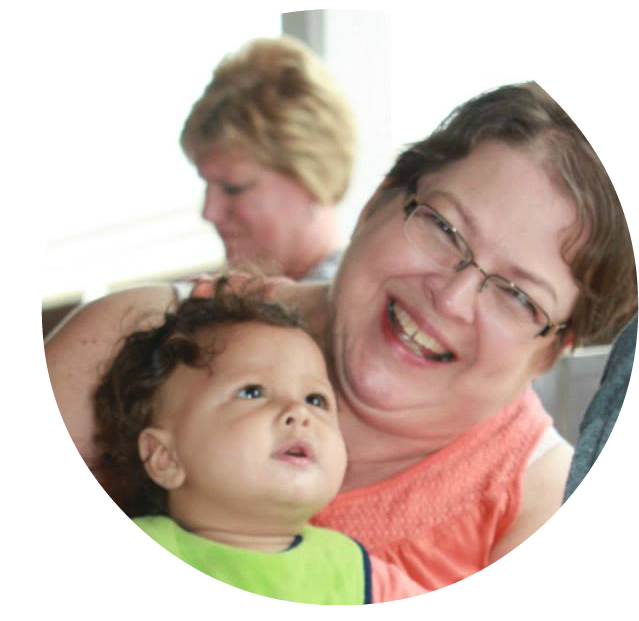 It all started with a referral from Vickie at More Stars in Comanche. I love these blog hops and look forward to many more in the future. Now to get down to the wicked matter at hand. Maywood Studio has created a fabulous line of fabric that we're using in our projects. It's called Black Cat Crossing. And not too many things scream Halloween more than black cats. 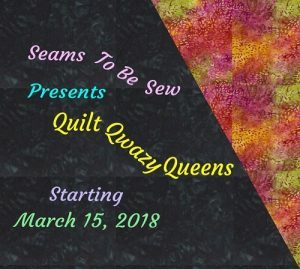 Wicked Wendy over at Why Knot Kwilt has been our cheerleader for this screamin event and Her Wickedness Mdm Samm at Sew We Quilt is our head witch (the good one you know). 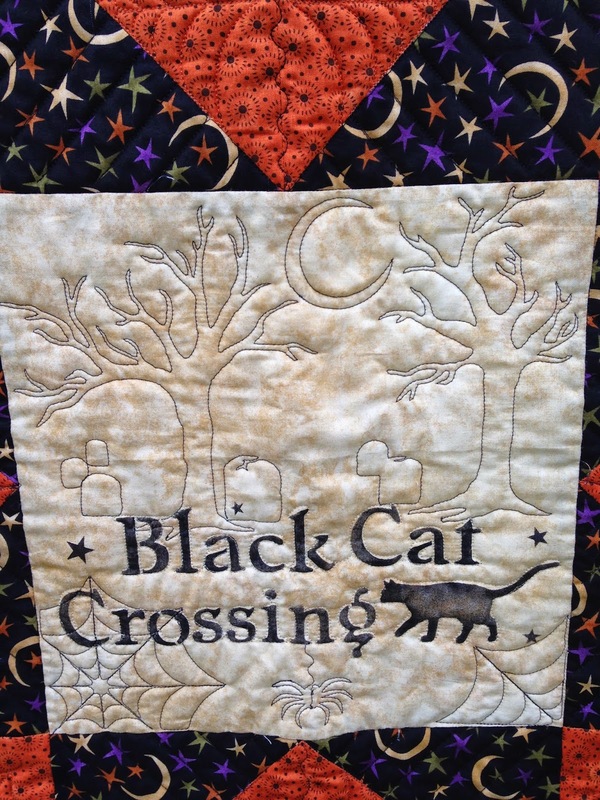 Here is what's been brewing in caldron... my wicked Black Cat Crossing Quilt. I love the oversized star for a pattern. I took the center block and made my own "panel". I found a stencil online from .... and stenciled my center block. Then a friend and fellow Statler Stitcher Owner designed the pattern for the quilting in the center. Spooky Trees, and spiders, and cob webs, OH MY. Once the quilting and binding were complete, I was off to the cemetary... yes I really went to the cemetary for my photo shoot. My wicked friend Cindy was my partner in crime for the first session. I showed William the pictures and he told me they weren't spooky enough so he and I went back for another go-around. I'm glad we did. I couldn't have gone by myself.... it was spooky in there and it wasn't even dark. It was late afternoon but it was cloudy and dreary! I really wanted the pictures to be darker but I just couldn't go back later and I was afraid the photos would be too dark if I waited much later. Yes, I was a scaredy cat! That evening at my sisters I saw this sign. I thought how perfect. No Scaredy Cats Allowed at her house! And then it got me thinking... so I decided to make my own sign from the stencil I already had. I made 4 of them (well actually William did most of the painting). One for me, one for Mom, one for my two sisters to fight over, and one to give away. Didn't he do a great job! 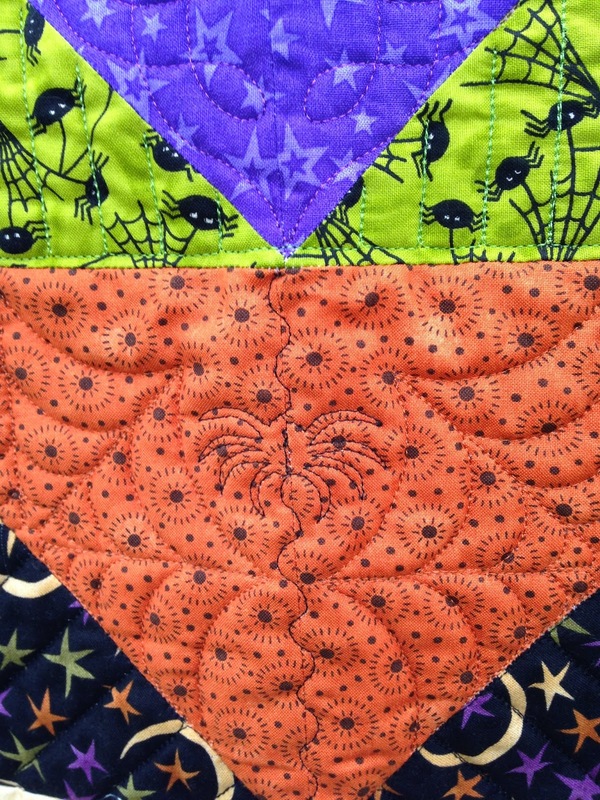 Just leave me a comment and tell me if you have Halloween quilts. I'll give the sign away using random number generator after the blog hop is over. Be sure you're not a no-reply blog commenter. I can't give it away if I can't contact you. Oh yes, I'll send it anywhere. 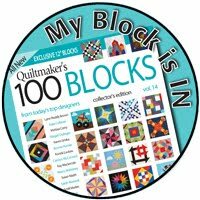 Now run like a scared quilter over to the remaining blogs and see what they've created. What a great setting for a photo shoot - I would be a scaredy cat, too - shivers! Lovely sign and purrfect for the season as well as a momento of the Hop. Spooky setting for some pics.. a graveyard! The detail on your quilt is amazing. Lovely quilt and you picked a perfect setting for your photos! Halloween is my all time favorite holiday! Thank you for sharing. Wow, love that quilt, so much great detail! Love the sign too, sew creative! Your quilt is beautiful! I love how you took the pictures. It really made it spoiky. I love your quilt, and you found the perfect setting for the photo shoot! I don't have any Halloween quilts in my home, but I made two a couple of years ago. Those were charity quilts donated to the children's ward at my local hospital. Love your star quilt! and the stencil and custom quilting is the perfect finish! Nice job and I love the center. I would have been a scaredy cat too. I am afraid in the dark outside. I made a pumpkin quilt. Gotta get that out and hang it up. Gorgeous quilt! I love the quilting and the stenciled design. I don't have a Halloween quilt. What a wonderful quilt. Spooky pretty. Loved thr toomstone pictures. And I do have several hallowe'en quilts. Love your project. We had a halloween party last Friday and ended up at a cemetary. Very spooky. LOL Doris, What great lengths you went to....to get THE PERFECT pictures for your PERFECTLY Quilted, wonderful quilt ! You are very talented behind that Queenie of yours ! Was that wrought iron fence at the cemetery !? Yikes ! Your sign is spooktacular ! Very nice, I love medallion style quilts and the fabric are gorgeous! Very brave taking photos in a cemetery! Love your quilt and that's some really great quilting. What lovely stitching on your quilt. You did a great job. Don't even know where to start...the stencil, the quilting design, the fact that you went into a cemetery--TWICE. Love it all. Your quilt just shines in that big block pattern. Love it. Yes, I have Halloween quilts but now I want another one or two. Something that really shows off the fabric like yours. Great quilt, love the little signs. You did wickedly good! Your quilt design turned out SPOOKTACULAR! I love the center block and the look of the whole thing, plus the quilting...wow! Pictures in the cemetery? Oooooo, scary! I have lots of Halloween quilts. I LOVE your quilt. I have some of that border print but couldn't come up with a great idea to use it in time for the hop. You did a wonderful job and the quilting is fabulous. I have a couple of Halloween specific quilts I put out in October but mostly I have "fall" quilts in autumn colors. The little sign is so cute--I have a black cat that looks just like that one!! You sure are a talented lady. I love the quilt and the sign is perfect. Thanks for sharing your creations with us today. Well now...what do you know about that??? I LOVE THIS ENTIRE ENTRY!!!! I had to even giggle a little that you went to a cemetery for some of the photos!!! I can just hear what anyone that saw it was thinking!!!! YOUR QUILT IS SO PERFECTLY DONE!!! All the little extra quilting touches!!!! and then that block that you did outlining the one panel...I AM IN LOVE!!! GREAT POST, GREAT PHOTOS, and WONDERFUL WORK! You are the CAT's MEOW today!!!! What great settings for your beautiful quilt! Wow! Stunning! Of course I have Halloween quilts! That is an awesome quilt. Love the design and the quilting too. You deserve a medal of bravery for your photo shoots-especially this close to Halloween. Great jovb. Love your quilt! I would not have thought to go to the cemetery for a photo shoot how brave of you. I like the signs your DH made the would be perfect for my house as I have a black cat (okay she has a bit of brown and white too) and an orange one too. Yes Doris you are the Stitching Queen!! Your Quilt is Stunning! Love the idea of using a Cemetery as a backdrop!! I would be a Cemetery scardey cat too!! Love your Halloween signs they turned out perfect. Always such a delight to come to your Blog, love the stories you tell long with your Images!! Awesome quilt....such details in the quilting...beautiful work! 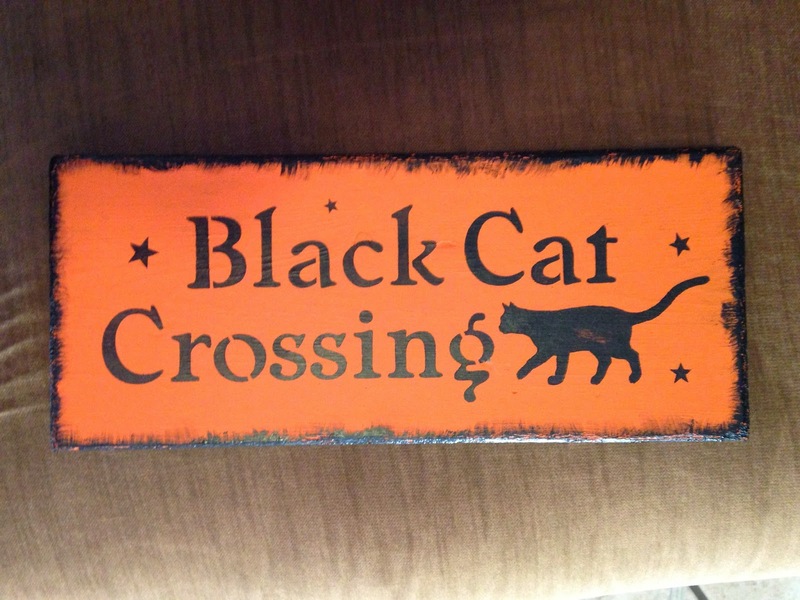 Your black cat crossing sign is...of course....Purrrrfect! Your quilt is lovely and the quilting on it is perfect. Your Black Cat Crossing sign is great. You did good! Using the cemetery was a plus.Your signs are so cute. You are one blessed quilter. What a spooky photo shoot! WoW! Congrats on a year with the hops. I do not have a Halloween quilt. I have had several black cats. I recently had to find a home for my last one. She went several states away to live with my grandson's step grandmother. I miss her. I have fibromyalgia and her treading was just too painful on the muscles. I recently was visiting my daughter and she commented on the black cats we had as she was growing up. I think they were all name Fred back then. Thanks for participating and sharing your fun. Thaks for the giveaway. I love how you did the border with the panel trees. It turned out great, as did your signs. Of course, I have Halloween quilts! Love love them. Stupendous quilt!!! Yes he did a wonderful job on the signs.Happy blog anniversary! Your quilt is so awesome. Thanks for sharing your creativity. Well hey! Happy anniversary to you too! I technically now have a Halloween quilt... and John and I have 2 in the planning stage for next year. I wanted to go to the cemetery as well, unfortunately it started raining on us. Next year for sure! Thank you and your husband for the giveaway! 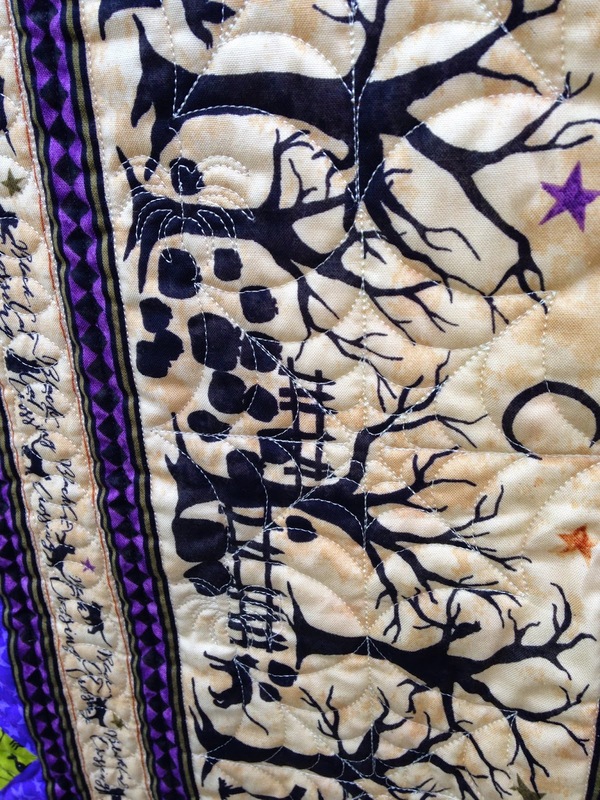 Your quilt is just gorgeous Doris and the pictures are very spooky.I love the quilting.It really looks fantastic. I think you are very brave to venture out in the cemetery even in the daylight. It did make a scary backdrop though.You did a wonderful job. Thank you for your giveaway. i don't have a Halloween quilt. Wonderful quilt! I especially love the quilting. I hang a stuffed pumpkin pillow on my front door for my Halloween decoration. Seeing all these Black Cat Crossing projects is definitely inspiring me to be more creative. I love your secret/surprise quilting; I do the same thing. Can't get any spookier than a cemetery! Your quilt is absolutely beautiful. Love your quilt and its wonderfully detailed quilting. Your signs are pretty cool too. This is my 4th Halloween hop, I made quilts for 3 of them. I love your choice of an oversized star for this quilt. Those purples and greens really pull you in to that fabulous center. The border is perfect as well. Great idea using a cemetary for your photos! No Halloween Quilts yet... hopefully someday! I had to laugh about your husband giving advice on your pictures... sounds like something my husband would say! He doesn't always take initiative to check in on what I'm doing in my craft room, but he is always very supportive when I ask his opinion. Your quilt turned out perfectly! Awesome quilt... love the stitching, especially the spider web in the corner! How cool is that??!! 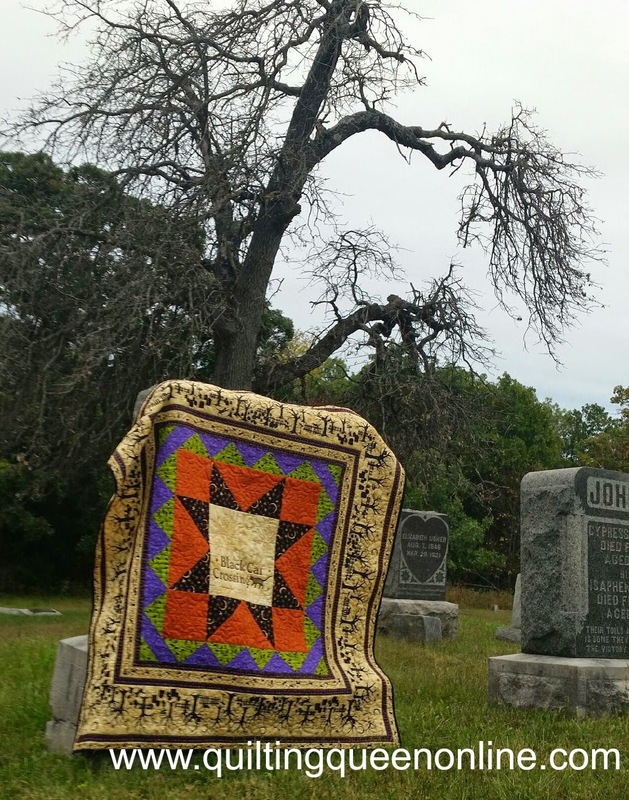 I like the quilting on the quilt, the cemetery is good. Not a single Halloween thing to be found in my house...no kids either! However, my daughter and granddaughters would love this!!! 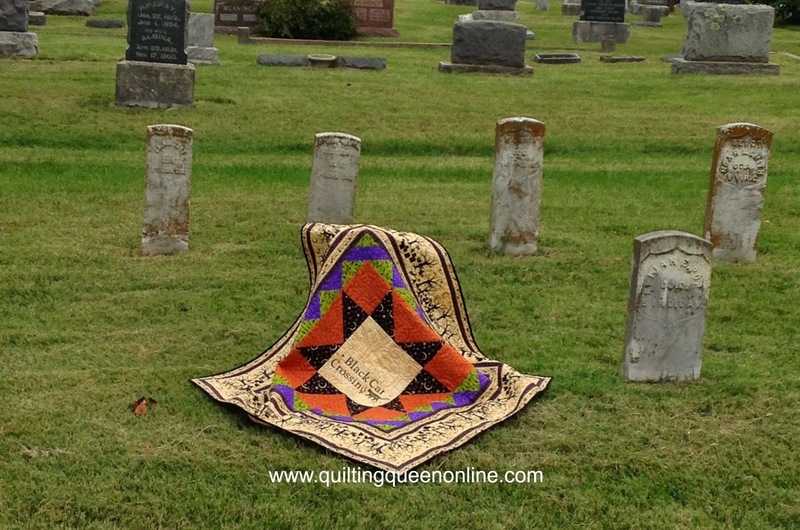 The cemetery quilting is fabulous!!! Your photo shoot in the real cemetery is spooktacularly scary!!! I would not have wanted to go back either !!! You did a great job on the quilt!! Fantastic quilt! You did a beautiful job. Love the embroidery. Beautiful quilting on your little piece! Love the sign...would be purrfect for my own black cat! I'm impressed that you did that yourself. Great job! Ilove your quilt! I just finished piecing an Autumn quilt. I also have a quilt with pumpkins from a swap - we wore that quilt totally out! such lovely quilt..i love it so much..
ohh i love to have halloween quilt..i dont have one quilt in my life and i love to have one..
Hi !!! Wow!!!!! I love your quilt and the quilting looks great!!!! Love the sign!!!! Great job hubby!!!!! I only have the small quilt from this hop for halloween but I do have one waiting in progress!!!!!! Ha!!!!! Maybe next year!!!!! Thanks for the fun!!!! How fun is that!! Love your Quilt..and very scary place for pictures! I woukldn't go after dark either! giggle Love your sign too! Wow! What a great photo op you took advantage of. great quilt. Great photo. Quilt AND sign are winners. Your quilt looks great Doris. I love the photo taken with the grave stones. I only have a small table topper quilted by another blogger of the ghastlies for Halloween. I love the center square especially Of your wicked quilt. 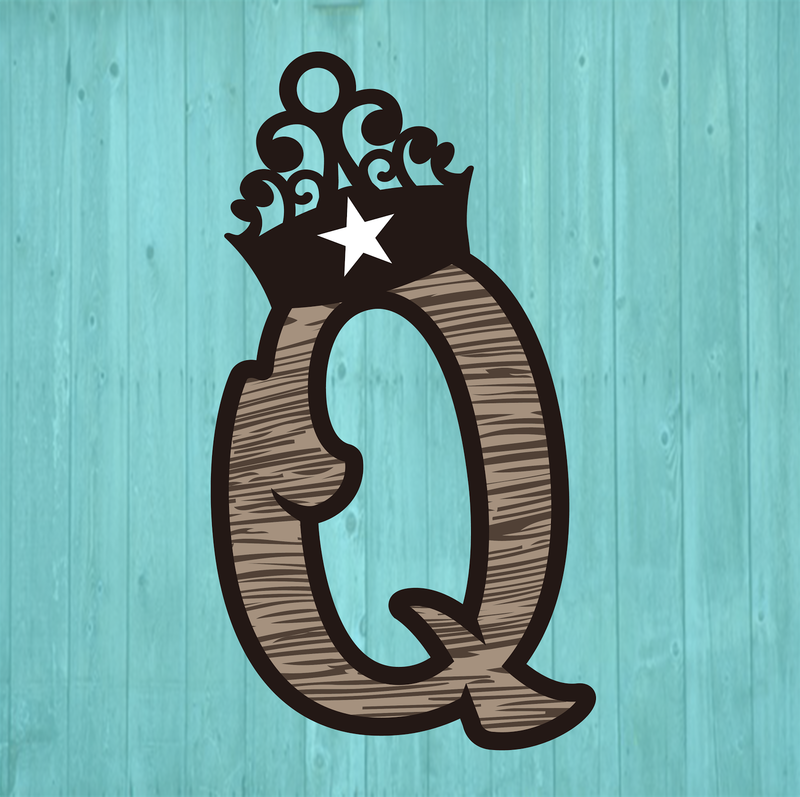 There are so many reasons you are the queen. Love the quilted center, just purrrrfect. I am so glad you joined the hop a year ago. I always look forward to seeing what you create. I actually celebrated my second anniversary with this hop. Have a spooktacular (not too much) Halloween! Doris you are such a delight. Your quilt with the stenciled center, oh my. The quilting...LOVE. What great photos. YOU are so BRAVE! and then a sign or 4 WOW. Loved you post! Happy anniversary on joining hops! I noticed the cemetery right away - how appropriate! Love your quilt - the panel you made for the middle - fabulous quilting in the whole quilt as well as the middle panel. Your stenciled signs are wonderful; how neat that your using the stencil beautifully is more ways than one. Wonderful pattern to emphasis the fabric. Great quilting too. Wow. I'm blown away. It is truly fabulous. No I don't have any finished Halloween quilts yet but I do have 2 minis and a wall hanging that are waiting their turn on my frame. I love how you used the panel!! and the sign is purrfect!! I don't watch scary movies, but I hope I'm not a scaredy cat!! Wow! Your ideas are wonderful. Thanks for sharing them. You do beautiful work. Love the quilting too! Love the spooky pictures and the signs you made. I have a couple of in-process Halloween projects and this makes me want to get them done!. Thanks!!!! I love this quilt! The border is perfect. Very clever way to use the print. So many fun, scary things! I only seem to have small Halloween items, so no quilts, but lots of penny mats and table toppers! Playing catch up and so glad that I did! 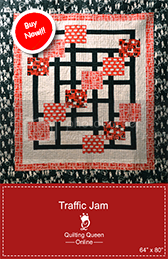 Congrats on being Madame Samm's pick of the day, your quilt is stunning! I have one Halloween quilt but I'm thinking I need to make another one. Thanks for sharing! I LOVE your quilt! The center piece is amazing. Beautiful work. I made Halloween napkins (some even glow in the dark) a couple of years ago, but I do not have a Halloween quilt. Not yet. This blog hop has certainly added a lot to my mental list of things I would like to make one day. Great job on your quilt! Happy Halloween! I have several Halloween items that I've made for myself & a quilt for my son that I did little embroidery blocks that I used for the center of the blocks. It's special it time of year for us. Thank you for sharing your goodies with us and the chance to win that totally awesome sign!! Happy Samhain & Blessed Be. Such wickedly wonderful ideas for a beautiful quilt! Gorgeous. 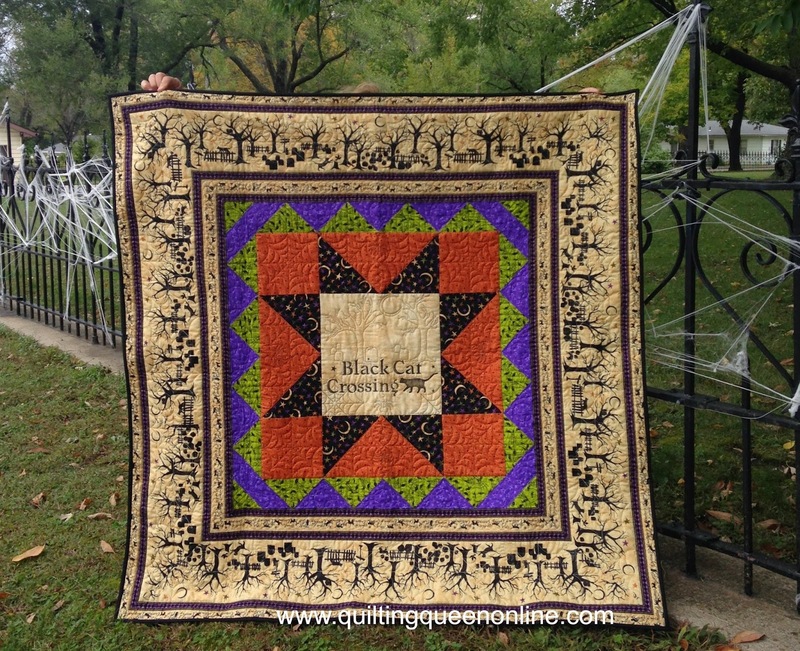 A spooktacular quilt Doris...love the border, the quilting is amazing and your photo shoot perfect. Totally awesome quilt and signs, thanks for sharing!! 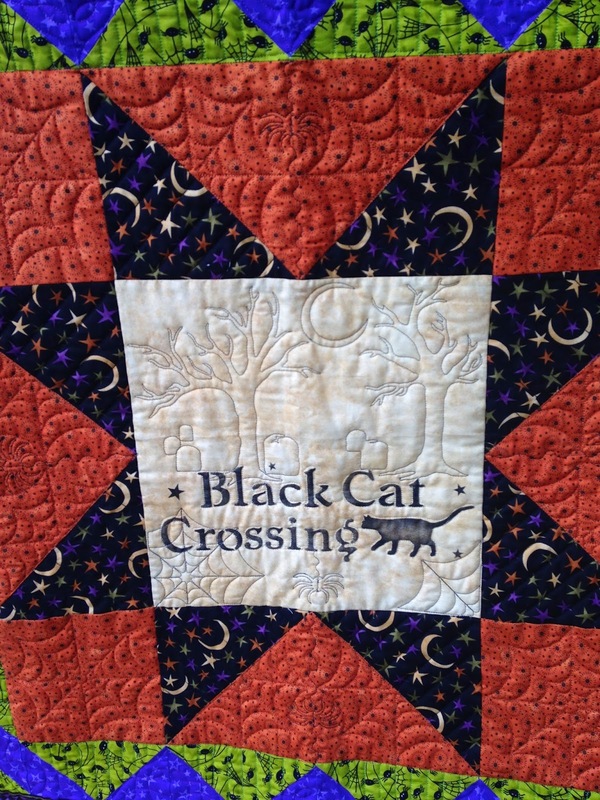 Your Black Cats Crossing quilt is fabulous! And so perfect to do the photo shoot in the cemetery. I really love the center panel you made and the quilting on it.